It doesn’t seem like 5 minutes ago we were watching Survivor Series, but here we are again with another PPV and the final one of 2014. 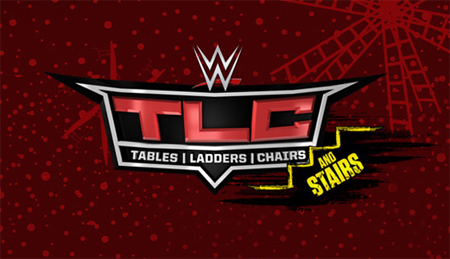 Table Ladders and Chairs…And Stairs (Sigh). During the week NXT held an incredible PPV in which we saw the debut of Kevin Owens, Fin Balor sport his famous paints and the NXT title switch hands. The event was a huge success and WWE fans were already predicting that this would put the upcoming TLC to shame. So how did the final PPV on 2014 go? This was an awesome way to start the night. Being in Cleveland, Ziggler was the home town hero and had massive support for this match. Right from the off both wrestlers brought in more and more ladders setting them up in all sorts of precarious positions. Some left alone but all knowing that they’d be used for a bump later on in the night. Ziggler being the king of selling looked gassed within the opening minutes in a dominant start for Harper. Ziggler received a nasty move involving the ring side and ladder resulting in a cut to his head bringing blood to the first match of the night. Harper for a big guy has already shown us he can also fly with the best smaller quicker wrestlers and proved this again tonight taking massive tumbles from great heights. 2 occasions the end result looked like it could have legitimately injured Harper as he dove through the ropes to hit Ziggler landing arm and face first onto a ladder set up between the announcer table and the ring. The same ladder brought him pain as he was thrown over the ropes and landed back first onto the ladder looking like he gave himself whiplash as the back of his head connected with the ladder. It was an awesome entertaining match with many big bumps and spots and got the crowd going. Oh and Ziggler won which went down well too. Another match in which Mizdow was the highlight despite hardly actually wrestling. The first stint saw The Miz in the ring for a long time and every move that landed on the Miz, Damien was copying ringside as has been the case for the past few months. A particular highlight was seeing Mizdow perform a handstand against the turnbuckle copying The Miz being put in vertical suplex. The match itself ended in a win for the Uso’s but they wouldn’t pick up the tag team titles (thankfully) as it was a victory by DQ as Miz hit Jimmy Uso with the slammy award that his partner won. Could have been a better match, I just don’t find the Uso’s entertaining at all. I began the night not really bothered about 2 matches on the card. And this was one of them. The Big Show on a heel turn. It’s really quite boring. But credit where it’s due the match that Show and Rowan put on was actually pretty entertaining. There were almost as many good looking bumps as the ladder match from the start of the night, and to see these bumps taking place with huge wrestlers made it look all the more impressive. Rowan created some kind of structure outside the ring with the stairs. It was eventually used as Big Show speared Rowan through it. A choke slam to Rowan on the steps also looked great. I did expect Rowan to win this though, surely Show won’t mind putting Rowan over who seems to be the forgotten Wyatt currently. Well that wasn’t the case as Show ended it with a knockout punch. The worst part of this match was the fact that Big Show used the steps to pin Rowan, but it looked very unconvincing. A match in which should Cena lose, He would lose his number 1 contenders spot and another opponent would be lined up to face Brock Lesnar (remember him? He’s the current WWE Champion) at Royal Rumble. Seth Rollins however wasn’t alone for this match, he had his security team of Mercury and Noble at ring side. Once again there were some pretty cool spots in the match involving the tables. The ref is knocked out at one point and Cena puts Rollins through the table. However the security team for Rollins lay into Cena while the ref is down and clear away the ‘evidence’ of the broken table by tossing it ringside. Cena gets revenge by using fencing from near the entrance ramp and rams Mercury with it, and then AA’s Noble into the crowd area back by the ring. There’s an awesome spot where Rollins leap frogs over a table to attack Cena, it looked pretty cool. As we all know that WWE is actually the John Cena show, they had to ensure that he looked good by giving him a spot to AA both Noble and Mercury at the same time. He’s overcoming the odds again! As the ref is regaining consciousness Cena put’s Rollins through 2 tables at ringside, but both Cena and Rollins go through at the same time. 2 more refs come to the ring, one declaring Cena the winner, the other Rollins. So the match is restarted. Cena attempts to put Rollins through the announcer table, but it doesn’t collapse instead resulting in Rollins falling into Michael Cole where he takes a page out of Ziggler’s book and sells the none contact. Big Show comes down to the ring because he’s a relevant heel now in the WWE to beat up Cena, but then some music kicks in which we’ve not heard in some time. Roman Reigns comes out through the crowd to save Cena . Cena then AA’s Rollins through a table to get the win and confirm he’ll be facing Brock Lesnar (and probably winning the WWE Championship) at Royal Rumble. The Diva’s division has certainly picked up in 2014, with some impressive matches at the majority of PPV’s. Unfortunately this wasn’t one. This was just a routine fill the time match. Not a lot stood out to compliment either of the participants. Brie Bella was rejected from ringside, that was about all that happened other than AJ losing due to having some unknown substance sprayed into her face. And if you thought the last match was dull, then my goodness this was terrible. I have no idea why this match was on so late. I have no idea why this match was on at all. I have to admit my focus at this point was not there, it’s gone 3am and this match is putting us all to sleep. Even my kitten who was rather playful throughout the PPV is now sleeping on my lap. I powered through and stayed awake, but I wasn’t watching the match. More so staring at the TV. A spinebuster onto a chair and a few chair shots to each other but yeah. Not fun. The Swagger vs Rusev feud is quite the entertaining one. They’re building it up nicely by making it personal with Zeb being injured by Rusev thus making Swagger want to beat up Rusev more. And the patriotic angle with USA vs Russia with a real American desperate to win the United States Championship. It builds up as a great angle. But they aren’t given enough time here or a great slot. The crowd aren’t that pumped due to the disaster of a match before it. We all know that Rusev won’t lose, and if he does it wont be via pinfall or submission, but rather DQ. Swagger did lots of work on Rusev’s ankle, but Rusev managed to hold on. Rusev picked up the win by making Swagger tap out. Good feud, and a good short match, but more time and a better slot should have been available for this match. As expected with these 2 guys, this match was full of epic looking spots and bumps. The fight went through the crowds and up to the table where the pre-show is. We’d seen alot of table and ladder spots from previous matches in the day, but that didn’t mean we had enough. And thankfully this match delivered. Ambrose climbing ladders and jumping off putting Wyatt through table after table, and the ladders were getting higher and higher. It was awesome. Bray Wyatt delivered one of the highlights without using a weapon as he hit a clothesline that wrapped Ambrose up. Kendo sticks were introduced to the match and set up on the ring turnbuckles. Amrbose was thrown into them and it could have gone horribly wrong if he didn’t get the right contact on them. Further on down the fight as both wrestlers are gasping for breath, Ambrose plants a kiss on Wyatt’s head, he responds by head butting Ambrose. He didn’t look like he enjoyed this. Another dive under the ring and Ambrose finds a tv monitor. Yup a TV monitor that is plugged in and actually… working. He runs with it to try and clock Wyatt in the ring, but the cable is too short, he tries again and the TV explodes either electrocuting or blinding him causing him to be pinned by Wyatt. I didn’t mind who won this match, both guys put on an awesome match, and it was nice to see a main event again that didn’t feature John Cena. And that’s the end of the 2014 PPV schedule. We’re a long way away from Royal Rumble, But I think it’s already starting to shape up what’ll happen. Reigns to win the Rumble, Cena to win the WWE championship. I think the only unpredictable thing is when will Rollins cash in?